Kay Flowers has been selected as the dean of Bowling Green State University Libraries. Flowers was selected following a national search. She has more than 30 years’ experience in university libraries. At Idaho State, a campus of about 13,000 students, she oversees the main library collection, the Idaho Health Sciences Library, the Oliver Law Library, the University Library Center in Idaho Falls and a joint library project with an area school district. Linda Kramer is the new Head Librarian of the Curriculum Resource Center. Linda’s previous experience as an academic librarian coupled with her years in school libraries and in the classroom serves the CRC, UL, and BGSU well. Kellie Tilton began a temporary, one-year appointment as Associate Librarian for Government Documents in August. Kellie has made significant contributions to the Government Documents unit throughout her employment on a Non-Student Letter of Appointment. Her excellent project management, planning, and organizational skills serve her well in advancing the work of the unit. Vera Lux began a temporary, one-year appointment as Associate Librarian/Instructor for Library Teaching & Learning in September. Vera comes to BGSU from the University of South Florida Tampa Library where, as Visiting Instructor Librarian, she provided both face-to-face and virtual reference services, instruction in undergraduate and graduate courses as well as individual research consultations, created web-based subject and course guides, and performed collection development activities, including a de-selection project. Vicki Seifert is now the full-time Library Associate 2 in the Curriculum Resource Center, effective in October. Vicki previously served as a Library Associate 1 in the Curriculum Resource Center. Each fall, the Department of Higher Education and Student Affairs presents the University Community Fellowship Award to a BGSU faculty, staff or student community member who has made extraordinary contributions to building collegial working relationships at BGSU. This year’s recipient was Cathi Cardwell, an Associate Professor in the University Libraries and the library’s Instruction Coordinator. She was chosen for her work as chair of the Connecting the Undergraduate Experience committee and service as Interim Vice Provost for Academic Programs from January 2009 to August 2010. Seven talented library faculty and staff members retired on June 30, 2010. Together they have served the University Libraries for over 215 years of service. We appreciate their extraordinary service and wish them all the best! The “Class of 2010” of includes: Cliff Glaviano, 26 years; Gaynelle Predmore, 30 years; Coleen Parmer, 34 years; Bette Blair, 33 years; Christine Plotts, 40 years; Mary Wrighten, 20 years; and Mary Reynolds, 33 years. power of storytelling through music at the third annual “Heavy Fundametalisms: Music, Metal & Politics” conference (sponsored by Inter-disciplinary.net; held in Prague). Arnold Hirshon was selected as Associate Provost and University Librarian. Mr. Hirshon was formerly the chief strategist and executive consultant for LYRASIS Inc., the nation’s largest library consortia organization serving libraries in the U.S. and abroad. John Stashinko was hired as Analyst Programmer 3. Cleveland Downtown campus of Bryant & Stratton College moved into their newly renovated, state-of-the-art facility at 3121 Euclid Avenue, Cleveland, Ohio for the start of the fall 2010 semester is September. The library is housed on the third floor of the new facility and is also home to the campus tutoring center. The Education Resources Center (ERC) at Columbus State Community College is pleased to announce the following promotions of their librarians: Kim Leggett, Supervisor 1 to Supervisor 2, Tracy Kemp, Librarian to Supervisor 1, Ryan Ziegler, P/T Librarian to F/T Circulation Program Coordinator and Dana Knott, Librarian to F/T Program Reference Coordinator. The Education Resources Center (ERC) at Columbus State Community College is pleased to report that it has currently begun the first phase of a three-phase building renovation. The entire renovation is projected to be completed with its transition from a traditional library space to a learning commons in Fall 2011. The Kent State University Libraries’ Department of Special Collections and Archives is pleased to announce the appointment of Stephanie Tulley as the 2010-2011 Dr. Gerald H. and Victoria C. T. Read Graduate Assistant. 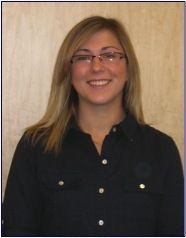 Ms. Tulley is currently pursuing dual Master’s degrees in business administration and library and information science. She is a 2007 graduate of Kansas State University where she earned a Bachelor of Science in economics and international studies. She is a member of the national Phi Kappa Phi Academic Society and was selected as a member of the National Society for Collegiate Scholars while at Kansas State. Catalina Oyler began work as the Five Colleges of Ohio Mellon Digital Initiatives Coordinator in July. Based in Oberlin, Catalina spends her time among all of the Five Colleges of Ohio (Denison, Kenyon, Oberlin, Ohio Wesleyan, Wooster). The Mellon Digital Initiatives grant, a $600,000 two-year project funded by The Andrew W. Mellon Foundation, supports efforts to integrate digital resources into the curricula of the five schools. Selina Wang is the new Head of Cataloging and Metadata Services. Selina’s first day on the job was November 1; she joined Oberlin’s staff after five years at MIT, most recently serving as Associate Head, Cataloging and Metadata Services, and Head of the Monograph Cataloging Unit. Prior to her MIT experience, Selina held library positions in New York State Library, University of New Orleans and as Consortium Librarian for the LOUISiana Library Network, based at Louisiana State University. Beth Forrest Warner has been appointed Associate Director of Information Technology for The Ohio State University Libraries (OSUL). Libraries’ Director Carol Pitts Diedrichs announced Warner’s appointment, which was made following a nationwide search. Warner has more than 30 years experience in information technology, automated library information services, management, and project planning. She holds a Masters in Library Science from the University of Denver. Warner specializes in technology planning, technical architecture, digital library services and systems, digital preservation, project management and evaluation, and grant writing. She is currently Officer for Grants, Research Support and Library Assessment at the University of Kansas. Warner will assume her new duties at Ohio State on January 18. The Ohio State University at Marion/Marion Technical College Library hosted the National Library of Medicine Exhibit, Harry Potter’s World; Renaissance Science, Magic and Medicine from October 31 – December 11, 2010. The exhibit explored the historical roots of a modern sensation thru the use of 6 large banners with themes of Potions, Monsters, Magical Creatures, Fantastic Beasts, Herbology and Immortality, using images from the National Library of Medicine. The campus library supplemented the exhibit with local displays, programs, an edible book contest and a chance to win a complete hardbound set of Harry Potter books. The library was awarded The Barbara Van Brimmer Academic Scholar Award in 2009 from The Ohio State University Prior Health Sciences Library to help with exhibit expenses. A project to provide digitized Ohio University Yearbooks was recently completed by staff at Ohio University Libraries. In addition, The Center for International Collections’ Southeast Asia Collection in Alden Library announced the release of a recent digitization project featuring selections from the diaries of King Chulalongkorn of Thailand. Visit these online collections at the Libraries’ Digital Initiatives page. His Excellency Festus Mogae, former President of Botswana, visited Ohio University’s Alden Library on September 28th as part of a visit to Ohio University. Alden Library has a long standing relationship with Botswana, being an official depository for Botswana materials since 1990. The depository and the Africana collection was recently mentioned as one of the strengths of Ohio University’s African Studies Program, designated a Title VI National Resource Center (NRC) by the U.S. Department of Education, ranking the Ohio University program among the top programs in the country. Materials from the Alwin Nikolais and Murray Louis Dance Collection, a part of Ohio University Libraries’ Mahn Center for Archives & Special Collections at Alden Library, will be on display at the New York Public Library for the Performing Arts from October 21 through January 15, 2011. The materials are part of an exhibit celebrating Nikolais’ work. This Fall, Ohio University Libraries began offering two new services – a Text-A-Librarian service and a mobile website. The Text-A-Librarian service, created by Chad Boeninger, Business Librarian and Reference Technology Coordinator at Alden Library, was featured in the October 20th issue of ALA’s email newsletter American Libraries Direct. Cleveland State’s Special Collections Department has led the Cleveland Memory Project since its beginning in 2002. Institutions as diverse as the Cuyahoga County Engineer’s Office, Berea Children’s Home, Rocky River Public Library, Hathaway Brown School, and Lakewood Historical Society have contributed materials from their collections to Cleveland Memory. Project partners have made more than 42,000 images and other historic items available online. Practicum and internship opportunities provide real world experience to students while bringing fresh from the classroom perspectives to practitioners. Cleveland Memory is a model of multi-institutional collaboration melding local collection knowledge, shared infrastructure, and professional development opportunities. OHRAB congratulates Cleveland State University and its partners for expanding access to Ohio’s historic resources. In 2006 the Montgomery County Records Center and Archives faced every archivist’s nightmare. Active mold, cracked spines on bound volumes, and inadequate storage threatened the existence of the county’s historic records. Through a systematic program of compliance with neglected records disposal schedules, environmental improvements and monitoring, and conservation treatment, Montgomery County Records Center and Archives staff have demonstrated that even monumental problems can be mitigated if approached with determination and creativity. The results of their efforts include reduced storage costs, improved access, and the confidence that the early records of Montgomery County will survive. OHRAB recognizes the Montgomery County Records Center and Archives for preserving Ohio’s public history records. The Ohio Historical Records Advisory Board is the central body for historical records planning in the Ohio. Board members represent Ohio’s public and private archives, records offices, and research institutions. Amy Pickenpaugh, former Chairperson of OLSSI: the Ohio Library Support Staff Institute, won the ALAO Award of Excellence. Austin D. Pevler joined Sinclair’s library staff in February as Reference/Digital Services Librarian. He holds an MLS from Kent State University and a B.A. in history from Ohio State University. Previously, Austin worked at Central Ohio Technical College and Denison University. Austin has a passion for Ohio history and genealogy. Recently, Wright State University participated in a Center for Transforming Student Services (CENTSS) audit for online student services. Wright State University Libraries’ “Library Elf Alerts” won a second place CENTSS Innovation Award for the Academic Services Suite– Generation 5. The complete list of award winners is available online. On October 30, 2010 Mika Sasaki was hired as a library assistant. She replaces Barbara Hicks, who passed away suddenly in May 2010. This entry was posted in Vol. 28 no. 3 (Dec 2010) and tagged People and Library News. Bookmark the permalink.